The fun things in life and potty! We've had an exciting two weeks! Woody and I have been in Greenville, SC working with a wonderful physician practice. This is my first two week engagement and it was a real experience. 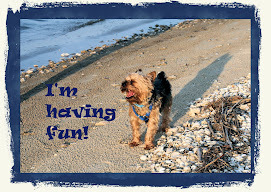 We had a delightful stay at Marriott's Residence Inn with Andy the Yorkie and Harley the cat! I love hotels that allow pets. As long as I have my babies and hubby, we can be at home anywhere. There are wonderful restaurants in Greenville...loved Pomegranite, TakoSushi and California Dreamin! Woody got to go visit his sister in Anderson and on Saturday, we drove up to Hendersonville, NC and did a little Christmas shopping...I've already given away two of my "Christmas" presents because they were so cool I couldn't wait...sorry Ginny and Libby! Oh yes...I did work about 10 or 11 hours a day, not counting the work at night! The fun parts of Hendersonville, NC were the Curb Market and Jump Off Rock...as we were hiking up to the rock, we saw a beautiful young woman in a Notre Dame shirt. We stopped to chat and her husband Michael turned out to be on the 1988 Championship team the year I was on campus finishing my MBA! There are always new friends when you travel. We had a great chat about ND and football and Lou Holtz. We also met a delightful older couple who reminded us of how much we should treasure our time and the ability to travel while we are "young enough" to enjoy it! We talked about how lucky we are to be able to travel while we still have our health. So my tip for the day: Don't put off things too long...you may not have the chance again! Now for the potty! Savannah came home and told mommy that she had to go poo poo in the potty! And success! She's a ways from being totally trained....but baby steps! Her potty plays music when she's successful. I guess the Elmo Potty CD and her wonderful day care are working!! Her mommy is traveling this week so we're keeping her a few days to give daddy a break. Our beautiful niece Olivia is playing soccer at Cumberland on Tuesday so we'll take Savannah to her first college game. Hope you have a wonderful week...and don't put off the fun things in life! We had the most wonderful trip to the Fall Pilgrimage in Natchez! The tour of antebellum homes was so much fun. The lovely families of Natchez open their homes during the fall and spring and other special times during the year with some homes offering tours year round. If you've ever had an interest in the south, the Civil War, priceless antiques and homes to die for...you must plan a trip to Natchez. Our favorite event was the Amos Polk's Voices of Hope Gospel Choir and dinner at the Carriage House Restaurant at Stanton Hall. I even got to sing along on Amazing Grace...and got invited to sing with them whenever I wanted! Obviously all those choirs in church and nursing school paid off! Woody and I took so many pictures...I just have to get them uploaded for sale soon! Several of the homes are really interesting...Longwood is the largest hexagonal home in the country...the basement is completely finished and the family was forced to live there when the war of northern aggression interrupted the building process. The main floor, second floor and up are unfinished just as left by the workers when the war started. Our favorite house was Rosalie...it is owned by the Daughters of the American Revolution and beautifully furnished and maintained. What was so fun was to hear the stories of so many of the houses from descendants! Several of the houses have been in the same families for decades. We even met the grandson of the family that owned TuJacque's Restaurant in New Orleans and the daughter of the CEO of Howard Hughes' Empire, Ginger Hyland, who has a collection of antique purses and crowns! We also met Jimmy the Crickett, aka Scott Smith of Spring Hill, who helps his friends with the tours. He is the most knowledgeable young man you could ever hope to meet about the traditions and antiques of the the era. His own home in Spring Hill is open for tours so I think we might have to drop in on him! I could post dozens of pictures since we saw 23 houses! And the food was fabulous...Sandbar just across the river in Vidalia, LA serves fried shrimp that is oh so close to Dewey's in Destin. Magnolia Grill's shrimp and grits and pan seared redfish are also divine. Cotton Alley Cafe was great for lunch and Breaud's Seafood had great grilled oysters. There was a cute little casino, Isle of Capri, that had a great southern foods buffet but I must say their slots were generous early in the evening and then got tight so you gave back all your winnings. The piece of advice for this post is to wear comfortable shoes! We walked and climbed stairs and hills over uneven surfaces but it was well worth it. You can have so much fun if your feet don't hurt. We watched people hobbling around...if they had worn comfortable shoes they would have had much more fun...besides, they'll never see any of these people again. Comfort over style when you're a tourist. There is a second piece of advice...look for local or near by festivals and events. You don't always have to leave the country or even the state to have an adventure! Now on to the next excellent adventure!